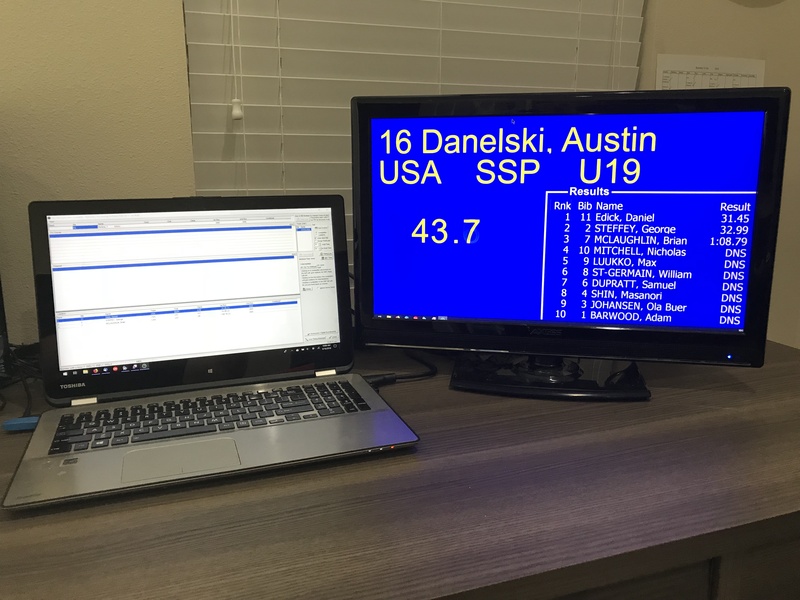 Split Second is the main supplier of Ski Timing & Scoring Software in the US and Canada, with markets in many other countries. We are proud to have stayed at the forefront of technology since 1990, creating cutting-edge software solutions for sports with a user-friendly approach. * NOTE: We will be out of the office until May. 4th. 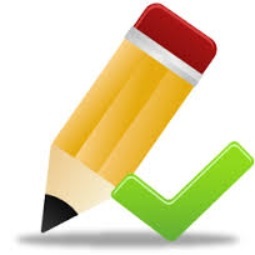 All license updates will be processed immediately as usual. Orders requiring shipping will be shipped when we return. Please contact us via email during this period. Sorry for any inconvenience. The Digital Scoreboard and the Digital Posting Board is now also available in the Club Software. At the moment these are only from the Single Course Timing screen, but will be added for Dual Timing as soon as possible. 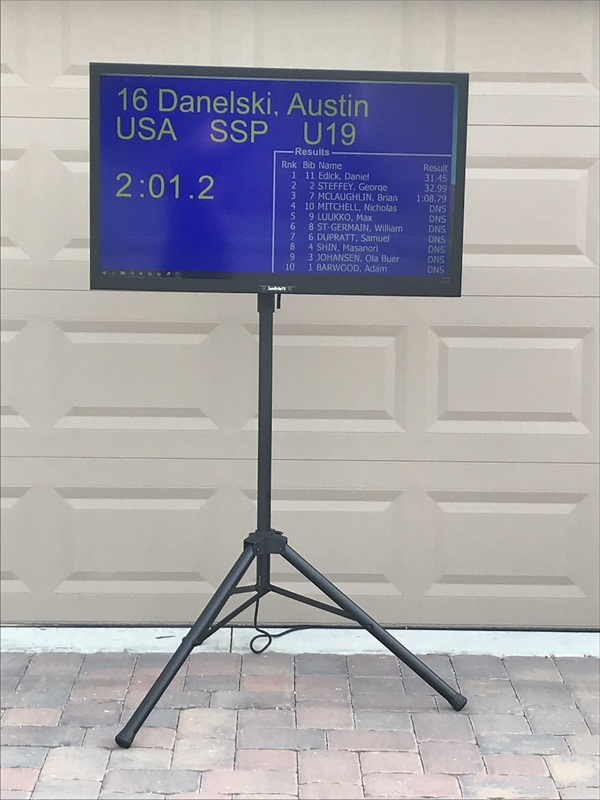 The latest revision of the Nat/FIS software (6.82 rev 4) includes a new "Digital Scoreboard" option - the Digital Posting Board. This shows 50 competitors at a time, always sorted by Bib, with all the information you would typically see on a posting board in the finish area of a race. Recent results are hilighted in yellow. If more than 50 racers it will go through multiple pages every 30 seconds. 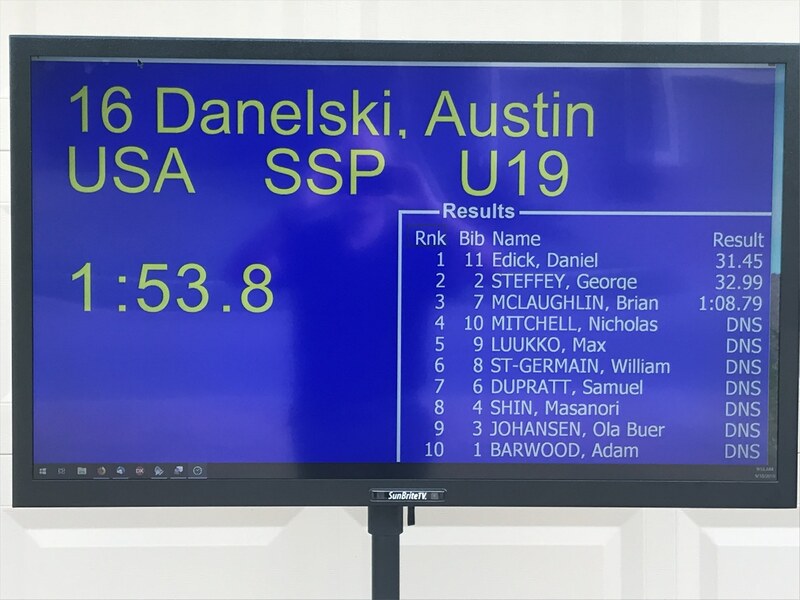 Note1: Currently the Digital Scoreboard options are only in the Nat/FIS software, but will be added to Club and NASTAR ASAP. Note2: These options do not scale, they are designed for 1080P resolution only (1080x1920 pixels). Special thanks to Fred at Phoenix Sports Technology for the idea and design for this screen. 9/18/2018 The Future of Scoreboards is Here! This season all software (Nat/FIS, Club, and NASTAR) will have the ability to output a Scoreboard image via TV output (HDMI). For temporary display around the finish area. For permanent mounting on your timing building. Any size TV you choose to purchase. Weather proof TVs are available (partial shade, or full sun). Off-the-shelf Video Wall technology to create a HUGE "scoreboard". Note: These photos were taken with running 10ths. Elapsed times are displayed to 1/100th along with rank. Directly controlled by the timing computer, so no delay. Running time to 1/10th second. Elapsed of run and Rank. 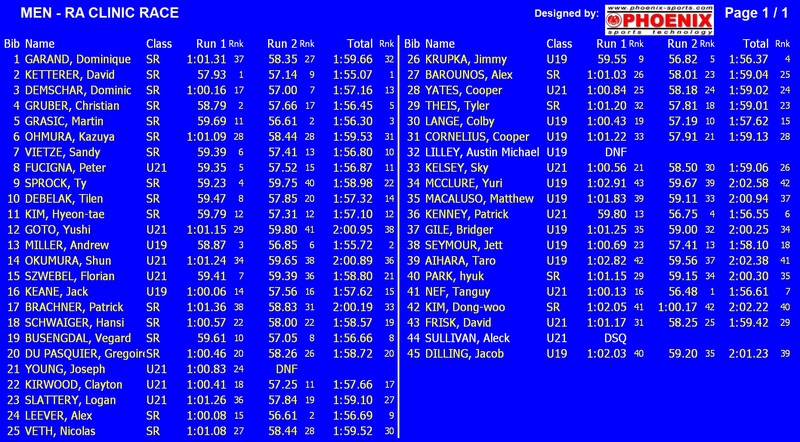 For two run races it as expected it shows 1st, 2nd and Combined time with ranks for each. Competitor List / Leader Board which scrolls 10 competitors at a time. Leader Board automatically changes to full screen when no competitors are on course. 43 inch SunBrite Outdoor TV (relatively small). Signal sent wirelessly (up to 660 ft range). 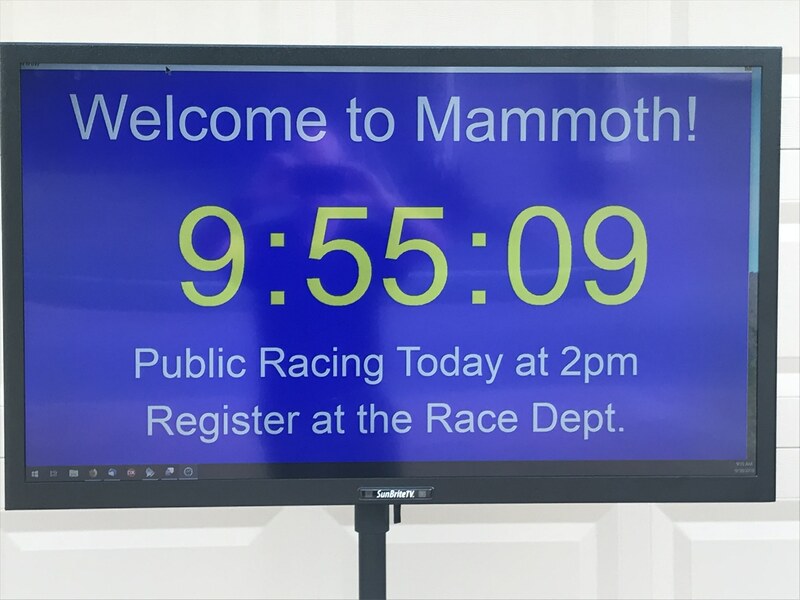 The display to the right could be used when not running a race. It displays the time-of-day and optional messages. Another similar screen is planned that will scroll through user provided graphics. To promote sponsors, upcoming events etc. A different layout for the timing screen is planned for use with Intermediates and Speed Trap data. It's all done via a 2nd monitor attached to the Timing Computer. All layouts are based on the 1080p format (1080x1920 pixels). The computer and all displays must be capable of this resolution (most PCs, and virtually all displays will). From the computer a cable goes to an HDMI splitter. One output of the splitter goes to the monitor next to the computer. This is so you can see what's being displayed. In this example the other output from the splitter goes to an HDMI wireless transmitter. Behind the TV that's outside is an HDMI wireless receiver.